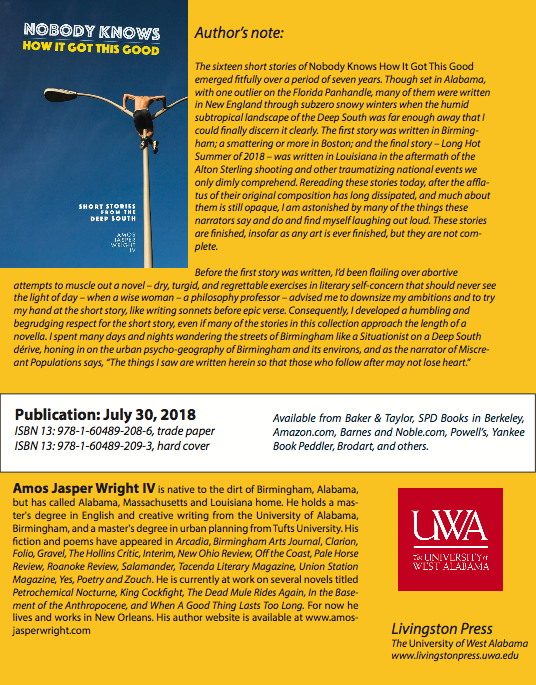 In this week's AWC member feature, Alina Stefanescu talks to author Amos Jasper Wright IV about Birmingham, fiction, maps, music, irony, and southern culture on the skids. All italics are Alina's and the rest is straight from Amos himself. Enjoy. Hi Amos. I understand you hail from Birmingham. Tell me about your time in the Magic City. Do you have any favorite places, whether pubs, cafes, or swimming holes? From a distance, what is most salient in your memories and affections? We often endearingly referred to the Magic City as the Tragic City, and though the city's image is evolving out of the shadow of its previous stigma it will probably always be more tragic than magic for me, though I acknowledge this may have more to do with my perceptions and experiences of the city than anything else. Nevertheless, there's enough magic there to motivate me to write about the city, even today. I'm often disoriented visiting the city now - the skyline is taller and there are investments where there used to be either vacant lots or abandoned properties. There were few condos then, and UAB's campus primarily served commuters as it struggled through the inchoate phases of developing an identity. The transit terminal still had its copper dome. Friends got robbed at gunpoint. Nobody cared about the Birmingham Barons before Regions Field was built by Railroad Park, though we went to the throwback games at Rickwood Field. The glory days of Legion Field were long past when the Crimson Tide played in town, though we went to soccer matches and some downright sad UAB Blazers games there on free tickets. People moving to the city now may find it incredible that Avondale was recently a ghost town, though layered beneath my memory there are those who remember Avondale and 41st Street before its cycle of decline. When I walked by the abandoned Pizitz Building, since repurposed as a food hall and apartments, I thought about my grandmother's memories of shopping there when it was still a department store. I am still processing my time in Birmingham, but the most salient and affective in my memory is the series of lifelong friendships I formed while living in Birmingham. We lived in cheap ratty apartments in Southside and Highland Park and threw house parties several nights a week. I've never found that type of friendship anywhere else. In the narrative we shared, Birmingham and Alabama were places to leave, if you had the means to do so - not everyone does. We congratulated ourselves as pioneers of the first wave of re-urbanization centered around the Phoenix Building where we briefly lived before moving to cities like Seattle, Austin, New York City and Boston. I had pretensions to the visual arts then, and we rented studio space at the corner of 18th Street and 2nd Avenue South, which is now the Railroad Square development. The transformation of this district and elsewhere has been startling and surreal, mostly observed from the sidelines, as Railroad Park was still in the planning stages when I lived there, though I am sure the residents of neighborhoods like Avondale are more startled than I could ever be. We rented the entire second floor of the Railroad Square building when Railroad Park was just an empty lot by the railroad tracks, made Gordon Matta Clark-esque sculptures and paintings, hosted art openings and threw parties on the rooftop. I sometimes feel that I've missed out on the redevelopment of Birmingham, but the world is much bigger than your hometown and maybe the city needed the energy of people from outside of Alabama or natives who did not share this tragic vision of the city. There was also something paradoxically exhilarating and morbid about making art and throwing parties amidst all this urban decay. In many ways, Birmingham was preserved like taxidermy by neglect because it did not experience the influx of redevelopment capital that wrought Sherman's Second March to the Sea upon Atlanta. Birmingham then was an apocalyptic, windblown aftermath in my imagination. Downtown has since developed the closest thing to an urban renaissance the state has ever seen, but many of the city's neighborhoods are still living this vision. Birmingham is now facing acute equity issues - when has it not? - related to the spatial distribution of the benefits of reinvestment. Anyway, I'm preaching now. The map of Magic City that Amos made especially for this interview. Many nights we crawled into the Leer Tower (you didn't have to break in - the building was already occupied by transients) right across the street from the headquarters of the Birmingham Police Department, took photos of the devastation, and climbed the stairs to the roof for the panoramic view of Jones Valley. Those types of experiences were probably the provenance of the vision of Birmingham as this tragic city desolated by suburbanization and white supremacy. We took the MAX transit buses all over the city, into neighborhoods like Woodlawn, Norwood, Ensley, Smithfield. Before the craft beer economy really boomed we often drove over to Atlanta, stocked up on beer and then smuggled forties and high gravity beers across the Alabama-Georgia state line. I blame the state legislature that till the age of about twenty-something the best beer I'd ever had was swill. Only in Birmingham would beer revitalize a dying town. Before Railroad Park the only greenspace in the city was Kelly Ingram Park and Linn Park. I went there on my lunch break and talked to bums or wandered around the Birmingham Museum of Art. Then the good ole boys down in Montgomery, in their infinite wisdom, updated the beer laws and released this untapped boozy potential - it was like the end of Prohibition. Economic development advocates will call this progress; others may call it the "whitening" of the city, but I'll refrain from jeremiads. Most of the bars we frequented, with the exceptions of The Garage, The Nick, and The J. Clyde are now gone. Most nights ended in debauchery and blackouts at the Upside Down Plaza, an underground bar like the last circle in Dante's Inferno. Secondhand smoke and bloody broken mirrors on the bathroom floor. Our less rowdy evenings centered around Bailey's Irish Pub, which was behind Dave's in Five Points and was gutted after I left. Bottletree closed sometime after I moved away. A blur of house parties throughout Southside, Highland Park and the few people then living in lofts downtown. After the Upside Down Plaza kicked us out we got drunk food at Al's Deli and Grill on 10th Avenue South. We unwittingly contributed to the ruination of Gip's Place. To swim, we dipped in cold water quarries in Tarrant or used Google Earth to find pools in the backyards and secret courtyards of apartment buildings whose fences we could jump. Niki's West out on Finley is still a place I try to meat-and-three whenever I'm in town. I would be remiss if I failed to mention Jim Reed Books, which was then on the second floor of a building on 20th Street, since razed for a mixed-use building. I can't thank Jim Reed enough for the oasis this bookstore represented - many of the books which influenced me were purchased from that bookstore. From the Phoenix Building we were around the corner from the 4th Avenue North Historic District. Bare Hands Art Gallery on 21st Street used to host a festival for Dia de los Muertos that everyone anticipated all year and where I first learned of the work of Civil Rights photographer Spider Martin. "Making it" in the Birmingham art scene meant having a show there. I worked at the downtown branch of the Birmingham Public Library, which introduced me to another aspect of the city, and after work took epic walks, usually with libations, and rambled about the quiet, empty city for hours, debating and arguing, talking with the strangers we encountered on the streets and planning our escape. Birmingham was like Dr. Jekyll and Mr. Hyde: after 5 pm, when all the commuters went home, the personality of the city totally changed - it got weird. Growing up, Birmingham was not a place most white people spoke fondly of - it was a place to work and then escape as quickly as possible to the homogenized safety of the Over-the-Mountain bedroom communities. More tragic than magic. Sloss Furnaces and the legacy of the city's industrial history loom large in my memory. Trips to the Civil Rights Institute left me daunted with the terrifying impression that something historically was very wrong with the city, sick even, but the vague malaise of the city stultified attempts to articulate the nightmare that was police dogs and fire hoses. Leaving gave me some perspective on that nightmare. I go home now and Birmingham, a city to which I owe much, no longer feels like my city, and maybe it never was. I love hearing your stories about Birmingham--it brings the terrain to life. Some of the spaces and names are so familiar, including Jim Reed, who did his time in service of AWC and the literary community. To narrow everything down now, what is your favorite place in Alabama and why? In a state with so many places of personal importance and interest, it is difficult to choose one, but I would vote for the Edmund Pettus Bridge in Selma because it symbolizes so many of the themes that resonate with me and was a literal battleground between the forces of reaction and those who dreamed of a more perfect republic, and though the bridge doesn’t figure prominently in the current short story collection, it is a place I have returned to many times in unpublished fiction. — Charles Morgan, addressing the Birmingham Young Men’s Business Club, on the day subsequent to the Birmingham Church bombing that killed four girls. I couldn't resist adding the epigraph from your forthcoming fiction collection above--the words of Charles Morgan in the context of the historical present-- a brave and poignant introduction to your stories, an earnest engagement with the past that many authors prefer to ignore. Writing from inside the southern space where history plays such a powerful role in politics, we are beholden to the past. Some writers have noted that the 2016 election affected their fictional voices. For example, one conversation I keep wandering into laments the loss of irony as a technique or tone. The rise of the alt-right and reality television strain the use of irony in the context of a postmodern presidency. Have you noted any changes in your voice or fictional style since the election? Why or why not? After the election, I immediately began drafting a “Trump novel,” which I am sure we will see many of in the coming years - I certainly am not the only one who did this. It was conceived as a dystopian political novel in which certain seemingly inconsequential details were altered, but details with momentous consequences when extrapolated out. Anyway, working on this novel at the same time that we were being daily Steve-Bannoned with randomized ambushes of spectacle events and political theater contrived for maximum whiplash was simply too overwhelming, and I realized the project could benefit from a few years of retrospection to process it all. I managed 30,000 words or so on this “Trump novel” before shelving it. I may never finish it, but at least it was cathartic. At the same time, this project accentuated the need for more direct political action, as writing a novel, even one of dissent, feels a little like “fiddling while Rome burns,” so to speak. But writers have produced enduring works through times even more tumultuous and disheartening than ours, so the political novel is likely here to stay. As for irony and tone, I haven’t noticed any dramatic changes in my fictional style, as I’ve always been engaged with social and political issues, even before seriously committing to writing, though the two novels I have drafted since the election possess an urgency about issues such as environmental catastrophe and race that might be new to me. I think irony and sarcasm are too deeply embedded in my style and voice to be totally suppressed by the shenanigans of the Electoral College - irony and humor have long been defense or coping mechanisms. However, the tone of one of the aforesaid two novels is more earnest, elegiac, lyrical and reflective than anything I’ve attempted before, though whether this is attributable to the current political climate or my maturation as a writer is probably unknowable or moot. For an off-hand experiment, can you list three of your favorite short stories and pair them with a favorite song and musician? You can explain or not explain. You can quote lyrics or stick to the links. I adore Clarice Lispector--she opened so many doors of permission for me as a fiction writer. Are there any superstitions or folkways in Alabama that spark (or have sparked) your literary attention? How does Southern life enter your writing? I still contemplate “non-southern” writing, as I hope to one day write about themes or subjects which are not quintessentially “Southern” (the “Trump novel” was an attempt at that), though who knows if that will ever come to fruition, but in a way Southern life is my writing, as much as I may sometimes balk at that. Being a “southern writer” is both a blessing and a curse, as you inherit a rich legacy and tradition of archetypes, consciousness, images, metaphors, landscapes, weather, and tropes in which to work, but the curse is that you are compelled to work in the long shadow of this storied tradition which can feel stultifying, and then you get branded as a “southern” regional writer for the sake of book marketing. Who wants to write in the shadow of William Faulkner and Flannery O’Connor? In that sense, the rich tradition becomes baggage. I lived outside the South long enough to put the South in some perspective, insofar as that is possible. My grandfather was an archaeologist, so I grew up being exposed to native myths, iconography and symbolism, as well as the myriad artefacts he collected and archived. Because of the materiality of these cultural artefacts, the Creeks for example seemed as tangible and real as the Methodists or Southern Baptists down the street. Anyone from Alabama inherits the omnipresent culture of the Bible Belt, so Christianity was syncretized in my mind with this early exposure to Native American culture. Even if you grow up in a nominally secular family it would still be a task to escape the influence of the Bible Belt; even the southern atheists I’ve known who resist it become as evangelical and zealous about atheism as the religious fanatics they were spurning. Reliance on this storehouse of hybridized imagery isn’t even conscious. We had our own miracles: men walked on water, harrowed hell and returned from the dead. Then there were the family stories and folkways, of Methodist circuit rider preachers and the wartime exploits of my grandfather who was a career pilot in World War II, the Korean War and Vietnam - aircraft appear frequently in some of my unpublished work. An uncle who set fire to a field just to see the fire trucks come. My grandmother heard George Washington Carver speak in Camp Hill, Alabama. A house divided by the madness of Alabama and Auburn football loyalties. The greater context for these familial folkways is the historical memory of the state at large, which did not always affect me directly, but which my family was very aware of as history: the failed Bonapartist experiment of the Vine and Olive Colony down in Marengo County; the Wetumpka impact crater, where a meteorite blasted the earth; the slave ship Clotilde’s illegal voyage from the slave coast of Africa to Mobile; the photo-journalistic forays of Walker Evans and James Agee in Hale County; the stories about the early industrial tycoons who founded Birmingham; the Tuskegee Airmen; the Free State of Winston; the quilts of Gee’s Bend; the Birmingham Civil Rights Campaign; the Montgomery Bus Boycotts and so on. As a society, we are probably more deracinated than ever, so these folkways have a way of grounding one in the specificity of a place. Thank you so much to Amos for taking the time to share his thoughts with us. 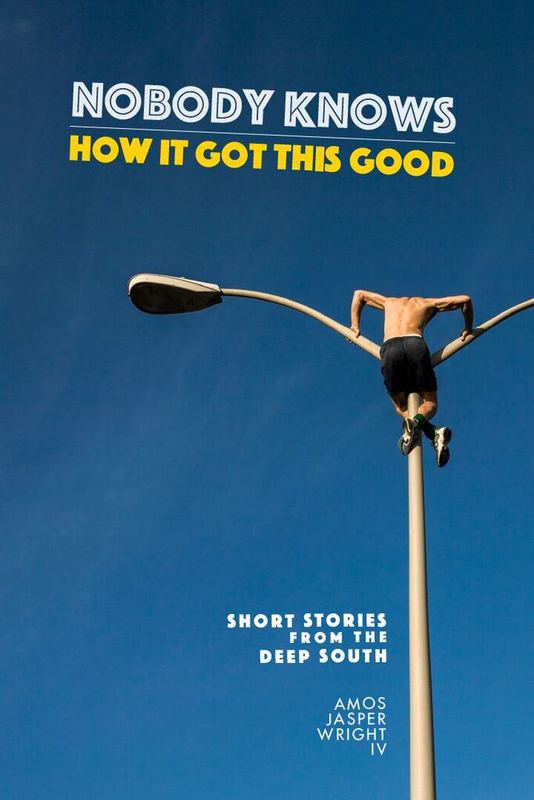 You can purchase a copy of his forthcoming fiction collection, Nobody Knows How It Got This Good, from Alabama's very own Livingston Press. And you should. 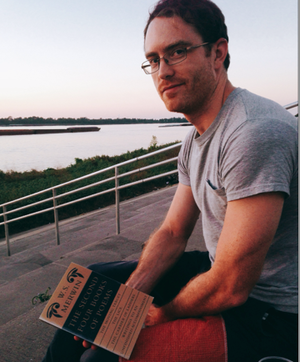 To sample Amos' writing, read "Aubade," a poem published in Gravel magazine. Or wander through his website to find more. AWC Open Mic on June 15th.